For those of you on Facebook, you're probably familiar with Throw Back Thursday (aka #TBT). When this trend started quite some time ago, I didn't get sucked in right away. I don't have a lot of before-the-digital-age photos in my possession. After seeing photos, from as far back as the 60's, scanned and posted by others, I didn't think my digital photos dating back 3 or 4 years ago would qualify as Throw Back Thursday. Throw Back Thursday is a free-for-all and, as I quickly learned, not limited to photos from decades ago. There are no rules. Maybe preferences, but no rules. Eventually, Throw Back Thursday inspired me to take a break Wednesday in the wee hours of the mornings. When most of the population is sound asleep. Drooling on their pillows. Snoring. Sleep farting. During this break, I click through old photos. Mostly of the kids. I relish these moments. I imagine this is what Moms of human kids do too. Sift through old photos. Maybe their kid is turning 16 soon and Mom is getting all teary eyed at photos when little Sally, who's not so little anymore, ran around the yard in only a cloth diaper and swam in the plastic pool naked on hot summer days. I can only guess. I don't have human kids. On occasion I'll participate in Throw Back Thursday. I did today with the above photo. Two days after Sophie joined our family. I was on the office floor. 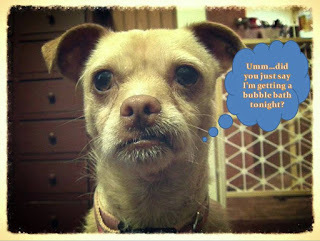 I broke the news to Sophie that she was getting a bubble bath that evening. She glared at me. I snapped the photo during our discussion. That look! She stared at me intently. I couldn't tell if she approved or was going to hate every moment of a warm bubble bath. Hours later, this was the scene. 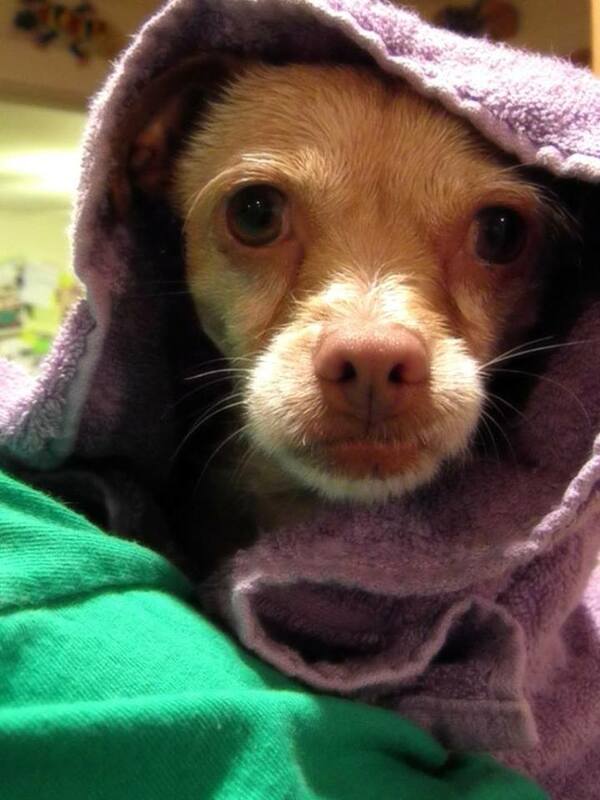 She didn't mind her bubble bath...or being snuggled in a warm towel afterwards.